I have hair like a lion's mane. That is the kindest way I know of saying that I have hair that refuses to sit down and stay flat and behave yourself, dammit. My hair enjoys the, shall we say, fluffy things in life. It is rather unapologetic in its reluctance to delicately curl over my shoulder. Or something. To further add to the sad state of affairs with my hair, up until a year ago I had no one to commiserate with. There are a precious few people who are resigned to dealing with the daily struggle of shampoo and hair gel and [insert other product here that smells of vanilla and inevitably breaks the promise to solve all of your hair care problems with just one squirt!]. So I do hope you will forgive me when I say that I was introduced to one of the loveliest (most grotesque, macabre, utterly and beautifully terrifying) writers in history because of our shared struggles of voluminous locks. Literary Love (affectionately known as #litlove) is a feature wherein I and friends around the blogosphere extol the virtues of various bookish topics. This month we're talking about Edgar Allan Poe! Don’t forget to check out the others’ posts on this topic: Alyssa on The Tell-Tale Heart, Taylor Lynn on The Raven, Christina on The Masque of the Red Death, and AnQi on Annabel Lee. It's true. Shamefully so, but true all the same. This is how the story began: a friend emailed me the picture linked above. As a joke, really - look, here's a writer who doesn't let his hair issues cramp his style! - but all the same, my interest was piqued. A quick Google search turned into something far less quick: a Sunday afternoon spent reading short story after short story, as many as I could possibly get my hands on - and thanks to the Internet, that translated into quite a few indeed. There is something truly captivating about the way Poe writes, interlacing the impossibly delicate with the shockingly grotesque. 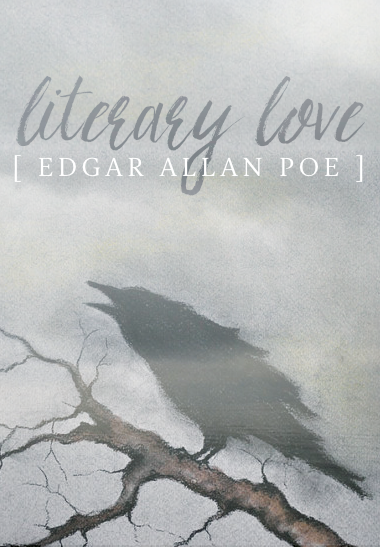 The elegance lies in the tragedy, the horror in the grace; perhaps we as readers are drawn to this impossible paradox, and Poe takes a twisted sort of delight in providing it to us. Still, I think it's fitting that the piece that truly unraveled me was not one of his short stories, nor even a more famous poem. No, the poem that shares my soul is just as unconventional as the way I found him: one that holds horror and tragedy only as minor roles in a much larger cast, one that contains something like - heaven forbid for any die-hard Poe fan - joy. Read it, won't you? I'll wait here. And now, read it again - if you'll indulge me, out loud this time. There is a music in this poem that can't be found in his other work, and it's brought by the emotion infused in every word. Here are four stanzas that could not be more different from one another, tied together only by the fact that they are spilling over with the rawness of humanity. Poe brings together merriment too light for air and desolation too heavy for tears, weaves them into a tapestry of emotion stretching far further than we might expect at first glance. One can hardly read the poem without feeling the velvety delight, the stricken alarm - and, more importantly, without recognising them in oneself. And herein lies the magic: though the piece is, most certainly, a far cry from Poe's usual shiver-up-the-spine brand of horror, the range of emotions it encompasses holds a poignancy that is a rare and lovely thing to stumble across. In this poem, we see ourselves as we are, as we have always been, as we might someday be: whether it is laughing in merriment, dancing in joy, fleeing in alarm, or sighing in tragedy. It is, I believe, the ultimate triumph: Poe manages to capture the spirit of humanity and the essence of something far greater. The horror is there, yes - but rather than dominating the tale, it plays only a small role in a study of what fundamentally ties us together. It's the things like bad hair days (or bad hair in general); it's the things like horror stories illuminated by flashlights and eyes wide open in the dark. It's the things like the happiness, the joy, the fear, the sadness, and through it all: the ever-present tolling of the bells - the bells - the bells.